The compact design of our cooling towers ensures when in operation they are inside the footprint of the vessel on hardstand, with the shortest possible power cable and supply/discharge feed lines. 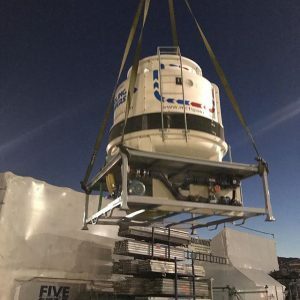 Specifically designed for single vessel use, meaning no cross-contamination or interruptions to supply while connecting other vessels. 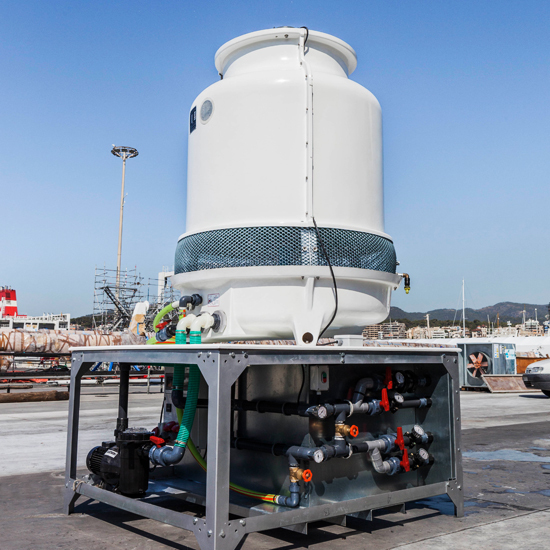 Induced draught evaporative cooling towers are an efficient, eco friendly, healthy option for keeping your vessel in normal operating mode when not afloat. The tower connects directly to your sea water inlet and outlet points. Operating your vessel with our specifically designed closed loop, filtered cooling, gives the seawater side of your system a health check, by removing any seaborne growth and containing such growth in our filtration strainer so as to not re-inhabit ongoing cooling. As an add on to our service we can introduce treatment chemicals to remove any stubborn growth and or calcium or other build up.